What it’s about: After a brilliant but asocial mathematician accepts secret work in cryptography, his life takes a turn to the nightmarish. Review: My initial reaction to this film was, ‘Over 2 hours of Russell Crowe, you’ve got to be joking’ but man am I glad I stuck through it all till the end. Based on a true story, this film follows the life of John Nash (played by Russell Crowe), a genius mathematician who’s life takes a turn for the worst when he realises his work and the people he knew were no more than delusions due to undiagnosed schizophrenia. This film is emotional and eye-opening and really speaks volumes about the seriousness of mental illness. At first I thought this film was a bit slow – being over 2 hours long an all – but it was all relevant in telling John Nash’s story with grace and giving it justice, otherwise it just wouldn’t have worked. You are led to believe that John Nash has been approached by the government to help stop the Russians building a supposed atomic bomb which will inevitably have catastrophic consequences. A large portion of the film is based on John’s work and the underlying issue is extremely well hidden, I for one had no idea of the extent of the problem. Eventually you learn that due to John’s underlying schizophrenia, John’s work isn’t real and neither are some of the people he knows, including his best friend from university and this in turn has huge implications on his wife and their marriage. I really liked how quickly they revealed everything so as to show how quickly John’s life turned into a nightmare and it is quite hard to believe that it is a true story but I think that makes it all the more worth-while to watch. They also take you right up until John is in his 70’s and has his illness at bay and his life back on track. Right up until the end, he acknowledges his problem and admits that it may well always be a part of his life. 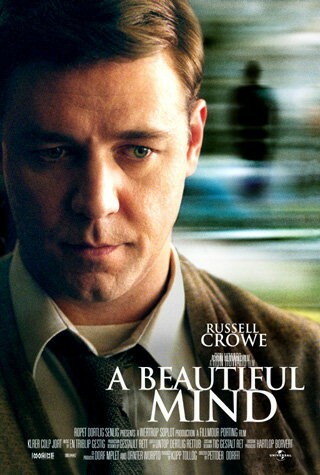 I’m not a huge fan of Russell Crowe but I think he played the part of John Nash fantastically. This truly is a wonderful film and it told a true but very dark story in a informative, creative yet beautiful way. For anyone that suffers from any form of mental illness, I’m sure you’ll agree with me when I say a lot of people don’t understand the seriousness and implications it can have on everyone and everything and they show this fairly well in the film, for example, in the case of his wife. But it also teaches you that there is light at the end of the tunnel. I’m not afraid to admit that I did shed a few tears at the end of this film, for John and for the simple realisation that you can make something of your life after mental illness.